The below reflections come from studying Isaiah 56:1-8. God wants his gathered people to seek him for Himself, not merely for His blessings, great though they are. He wants us “to minister to Him, and to love His name, and to be His servants” (Isaiah 56:6). Then, he promises to “make us joyful” in his house of prayer for all nations. He’s the one who is calling the nations to Himself. He wants us to know that we are never stronger than when we are most aware of our weakness, and therefore most dependent on Him. God values a heart for Christ. That’s how he defines spiritual authenticity… We draw lines of exclusion that God wants to erase. He throws the doors wide-open to all alike who will take Christ as their legitimacy. What matters in church is what matters to God, especially the gathering in of outsiders (John 10:16), and nothing else matters. When we accept that and implement the implications in our churches, we move toward revival. bow to become his slaves for love and we find ourselves wearing crowns. In recent days, I have spent time with people from various parts of our country who have a legitimate beef with the church of Jesus. They have been hurt or disappointed by the church. Church leaders have failed them. Pastors come for counsel who have been hurt and betrayed by their leaders. Church leaders have been maligned and marginalized by their pastoral leadership. I think it is important that we do three things: First of all, we need to know that we are in the midst of a spiritual battle and that the devil delights to send ravenous wolves among Christ’s sheep to devour, and all church leaders have wolf-like tendencies that we need the Holy Spirit to curb. Secondly, we need to know some of the cultural trends and riptides that are eroding the effectiveness, peace, and purity of Christ’s church. Thirdly, we need to recommit ourselves and our resources to see the gospel make progress through our intentional commitment to a local church that is led by imperfect leaders who have feet of clay. “In recent weeks the Occupy Wall Street movement has focused on the economic gap between the wealthiest one percent of the population and the remaining 99 percent. As others have observed this movement reflects a mix of anti-institutionalism and disillusionment with the economy, government and financial industry. But perhaps Americans’ growing dissatisfaction with institutions is more influenced than they realize by their own personal expectations and experiences. While people are increasingly skeptical of external forces, like religion and government, the research shows that internal doubts about fulfillment, faith, emotion and personal history significantly define millions of the nation’s residents. The prophet is deeply moved. Something grips him. What is it? Zion, the city of God, the church, is reduced to contempt. Salvation is not going forth from her like a burning torch. the nations see nothing of God in the human landscape. Isaiah’s heart is broken for God’s people in his generation. When salvation is not going forth as a burning torch, God is saying, “Your life passion should be defined with these three words: for Zion’s sake. When they lay you in the grave, this should be the epitaph on your gravestone: ‘For Zion’s sake.’ That should be the statement your life makes, because I have appointed my church as the human delivery system for joy inexpressible overflowing onto a dying world. That’s my plan, and there is no Plan B. Over the last thirty years of so we American Christians have diminished our very capacity for revival, and we’re laying a foundation of sand for the future. We’ve jury-rigged our own hybrid version of Christianity that doesn’t even think in terms of the loyalty inherent in the words “for Zion’s sake.” So many Christians today are living a conveniently free-floating way of life, it doesn’t feel misaligned. It feels normal, and costly involvement feels like a super-spiritual option. But to God, church -hopping, self-protecting, me-first Christianity isn’t even recognizable. “For Zion’s sake” defines a way of life that works and prays and tithes and gets involved. Church membership vows could be summarized with these three words: “for Zion’s sake.” But our generation is disinclined to that kind of gutsy intentionality. What’s happened to us? We’re being changed not by the gospel but by a hyper-individualistic ethos of devotion to self. Complicating that is the fact that many people have been wounded by the church. Personally, the worst experiences of my life have been within the church. Why go back in? Because of God. God has made an everlasting covenant with his church, and her salvation will go forth like a burning torch. That’s the future of the world. Dear as the apple of Thine eye and graven on Thy hand. For her my tears shall fall, for her my prayers ascend. To her my cares and toils be given, till toils and cares shall end. The above lengthy quote and insights come directly from Ray Ortlund Jr.’s commentary on Isaiah entitled Isaiah: God Saves Sinners, pp. 414-415. I would commend it strongly to you. Ray Ortlund Jr. writes in his commentary on Isaiah that “every faithful church is a gateway into the future of the world.” If we are honest, it doesn’t seem that way at times. We are quickly annoyed, frustrated, and challenged by living, worshiping and serving Jesus together as vital participants in the body of Christ. On top of this, we have an adversary who oppresses, tempts, and opposes us at every turn. C.S. 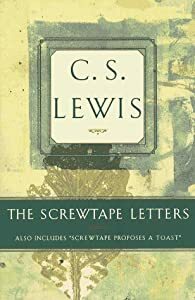 Lewis, in his classic Screwtape Letters, reminds us how a senior devil trains a junior devil to deceive young and old Christians. Listen to a demon’s strategy on how he uses a person’s disappointment with the church to ensnare, and pay careful attention because this phenomenon is pervasive in the church of Jesus today. One of our great allies at present is the Church itself. Do not misunderstand me. I do not mean the Church as we see her spread out through all time and space and rooted in eternity, terrible as an army with banners. That, I confess, is a spectacle which makes our boldest tempters uneasy. But fortunately it is quite invisible to these humans. All your patient sees is the half-finished, sham Gothic erection on the new building estate. When he goes inside, he sees the local grocer with rather an oily expression on his face bustling up to offer him one shiny little book containing a liturgy which neither of them understands, and one shabby little book containing corrupt texts of a number of religious lyrics, mostly bad, and in very small print. When he gets to his pew and looks round him he sees just that selection of his neighbours whom he has hitherto avoided. You want to lean pretty heavily on those neighbours. Make his mind flit to and fro between an expression like ‘the body of Christ’ and the actual faces on the next pew. It matters very little, of course, what kind of people that next pew really contains. You may know one of them to be a great warrior on the Enemy’s side. No matter. Your patient, thanks to Our Father Below, is a fool. Provided that any of those neighbors sing out of tune, or have boots that squeak, or double chins, or odd clothes, the patient will quite easily believe that their religion must therefore be somehow ridiculous. At his present stage, you see, he has an idea of ‘Christians’ in his mind which he supposes to be spiritual but which, in fact, is largely pictorial. His mind is full of togas and sandals and armour and bare legs and the mere fact that the other people in church wear modern clothes is a real – though of course and unconscious – difficulty to him. Never let it come to the surface; never let him ask what he expected them to look like. Keep everything hazy in his mind now, and you will have all eternity wherein to amuse yourself by producing in him the peculiar kind of clarity which Hell affords.